Outside of central KL there are a number of places of interest for tourists. The most significant one are the Batu caves to the north of KL, a centre of Hindu worship. 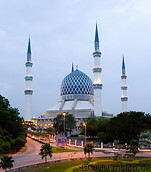 Other places of interest include beautiful mosques and shopping malls in the suburbs. The easiest way to reach these places is by taxi, because public transportation is a bit spotty.